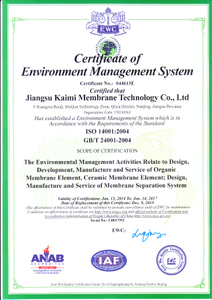 Jiangsu Kaimi Membrane Technology Co., Ltd, located in Nanjing, China, was established at 2002, occupying approximate 8.25 Acres with 70 Million RMB registered capital. 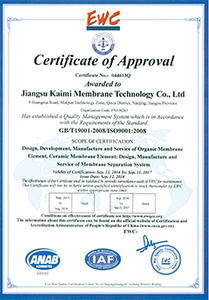 KAIMI focuses on membrane production, research, membrane application and overseas project service. It is a professional tubular membrane and ceramic membrane manufacturer. The equipment provided covers MF, UF, NF, and RO relying on many years’ engineering experiences and teams. 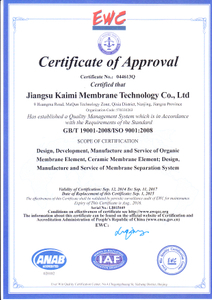 Besides, Kaimi is OEM of some well-known American membrane company. The products are exported to overseas, and successfully establishe economical and technical relationship with European, American, and Asia pacific countries. 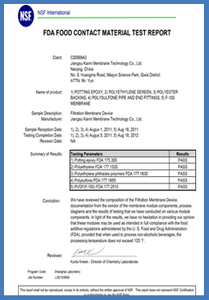 Over the years, Kaimi R&D has made a great process on membrane technology and application. The continuous investments and patents in research bring reassurance to our advancement. Where there is a demand, there is a way. Well-equipped R&D Center lets the work be successfully carried out. New products is constantly appearing according to the customers’ requirements and expectation.